Our line of Semi-Custom homes are designed with one primary goal: your peace of mind! After going through the process of building custom home after custom home and watching our customers spend countless hours and stress trying to make decisions in a sea of options, we thought long and hard. How we can make our customers experience better? How can we value their biggest assets and turn a highly stressful process into a seamless painless process? In this world, I think we often forget our time is one of our biggest assets! You have families, business, work, church, sporting activities etc., do you really want to look at 100 flooring options? We have created a data base of options and build a design center in one of our model homes to streamline the process. We have went though the pain-staking process of creating preset selection options for each plan, still giving you a data base of "multiple choice options." In our Semi-Custom line of homes you still get to pick from multiple plans, multiple lots, multiple floor options, cabinet colors etc. You can do it all in a very stress free environment as quickly as 2 two hour meetings with our design team and know the exact cost of your home upfront with your exact move in date! We also know your hard earned money is a very valuable asset and our goal is to get you into the best home possible. Since our semi-custom homes have all design work done, you don't incur design cost. With our specific plans, we know our exact cost and have pre-negotiated pricing with our vendors and sub-contractor so that we cannot only lock in cost, but we can bring it to you at a lower cost that is often cheaper than a new construction home that is sitting on the market incurring interest. We'll start by meeting at the model home. You'll shake hands with the team who'll be taking care of your home, get pre-approved for your loan with Flat Branch Home Loans, and figure out your budget. After you've been pre-approved, it's time to pick your plan and let the customizations begin! We have multiple plans and elevations to choose from. Then we'll move on to selecting finishes from the displays in our model home. 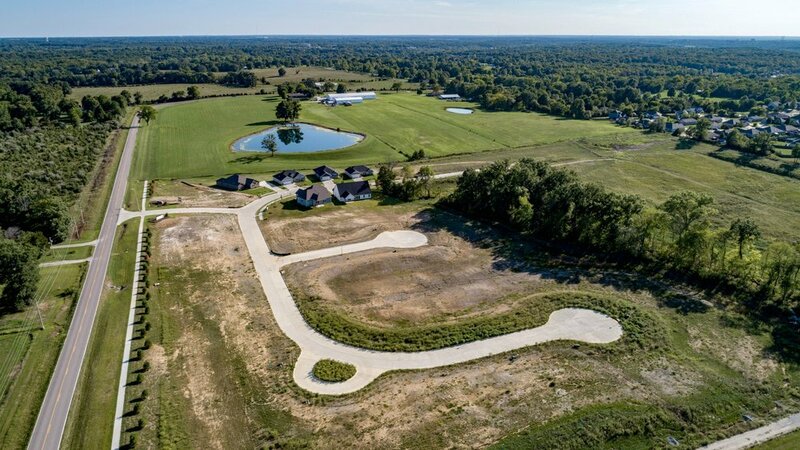 We can build anywhere in Columbia, but to help you control cost we have lots in both Fox Creek and The Vineyards subdivisions. The community of Fox Creek provides exemplary and innovative design and construction opportunities for the astute new home owner. Fox Creek is changing the way neighborhoods are envisioned, constructed and maintained by being committed to advancements in technology, quality, energy efficiency, and the use of environmentally friendly products. Located in Northeast Columbia, Fox Creek provides quiet seclusion with easy access to both Highway 63 and Interstate 70. Catering to a wide variety of lifestyles and living requirements, Fox Creek delivers modern green living to families looking to raise their kids or age in place. For more information about lots in Foxcreek, click the button below! The Vineyards is a quiet, yet friendly, neighborhood nestled in a pastoral setting covering more than 70 acres of rolling hills and wooded creek valleys on the eastern edge of Columbia, Missouri. Wonderful lots are still available offering residents access to beautiful green space, a community clubhouse and a two-level salt-water pool featuring a waterfall. Interested in building a home a home in the Vineyards? Then let's start talking about your project! Click the button below to get in touch.